Sometimes you want just a little extra pizzazz when it comes to sending out a note card to someone special! This project is perfect for that need. This adorable satchel holds four coordinating cards and can be done up in lots of varied themes to appeal to almost anyone, young or old! And while you’re at it, make several sets to have on hand for gifts! 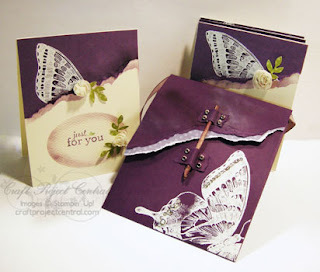 This gorgeous butterfly project was designed by Donna!